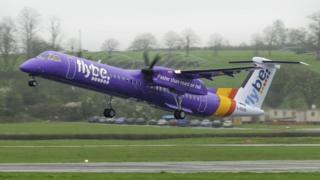 Flybe has announced plans for the first flights between the Isle of Man and London Heathrow since 2002. The airline is to operate a daily service from 21 April using a 78-seat Bombardier Q400 aircraft. Flybe will operate flights to five destinations from the island this summer from its newly re-opened base on the Isle of Man. CEO Roy Kinnear said the airline was "delighted" to provide a new link to England's capital. He added: "We look forward to welcoming many new passengers on board."